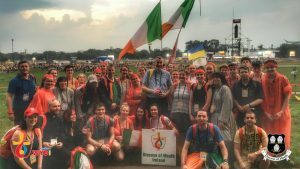 Meath pilgrims at WYD2016 with Bishop Denis Nulty of Kildare and Leighlin. “A pilgrim and a tourist may follow the same itinerary, but the pilgrim is on a sacred journey in which God is encountered through people, places and situations,” Bishop Denis Nulty of Kildare and Leighlin has said. He was delivering a reflection on 28 July to Irish pilgrims gathered in the Polish city of Krakow for World Youth Day 2016. The young pilgrims were being hosted by the parish of Kazimierz, which is also an English language catechesis venue. During the past year, many young Irish people have been meeting locally and preparing for their pilgrimage. Yesterday’s gathering was an opportunity for young pilgrims to meet their fellow Irish pilgrims from throughout Ireland, beyond their own diocese. Concluding he said, “Tourists pass through places, they seek out the ‘old town’; pilgrims pass through places, seeking out the new kingdom of mercy, love and peace. May we find that as we travel our journey accompanying Pope Francis over the next number of days’’.